AALL has a strong commitment to serving its members through its government relations program, based out of our Washington, DC office. The government relations program is developed in accordance with AALL's Government Relations Policy and in consultation with the Copyright Committee and Government Relations Committee, and, where necessary or appropriate, the President or Executive Board of the Association. 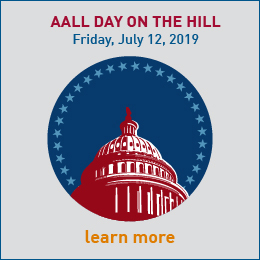 Read the AALL Public Policy Priorities for the 116th Congress.